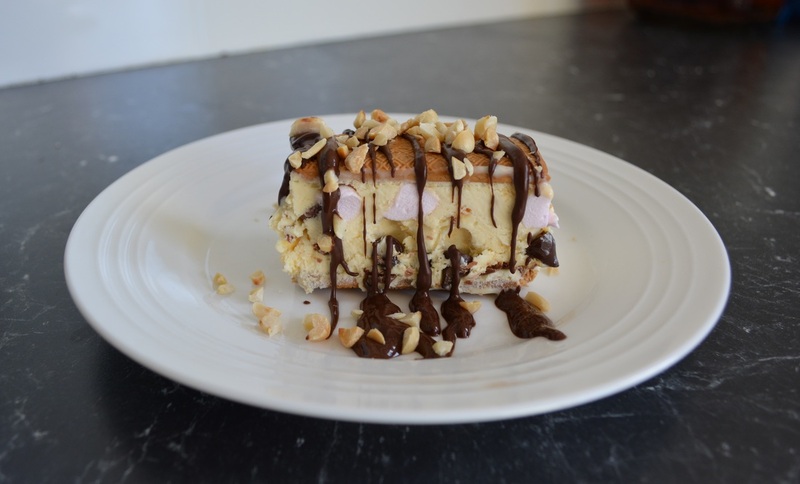 I was at a family party when I first tried a homemade ice cream slice. I loved it so much that I did what I normally do, I needed to find a recipe so that I can make it home. It wasn't difficult to find the recipe so off I went making it. What I thought the original party recipe needed was a chocolate sauce to go on it (I will provide the recipe to a chocolate sauce, but feel free to use Ice Magic from the shop if you prefer, both work really well). The chocolate sauce gave it a lovely finish, made it look like a proper dessert. 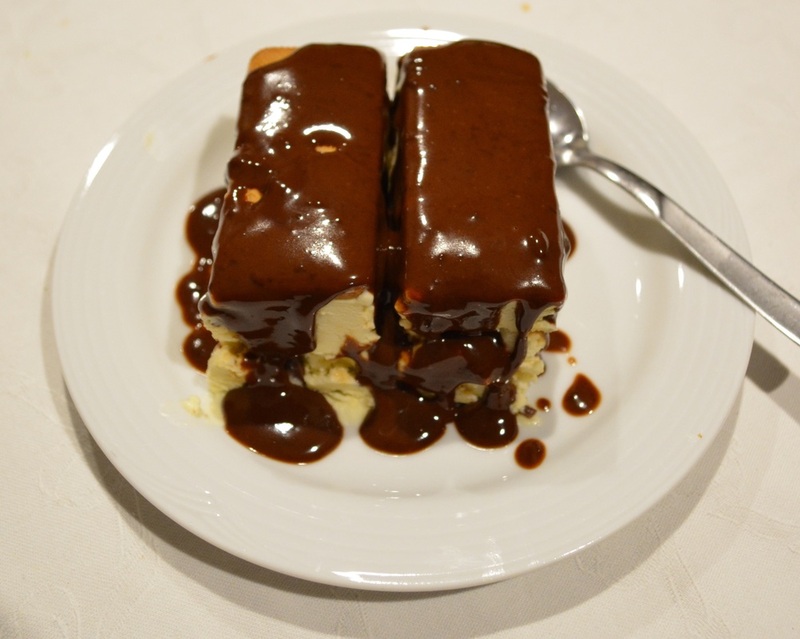 For large parties, I would just serve Ice Magic on the side, easier, for small gatherings, I'd plate it up with homemade chocolate sauce. Now although my family loved the original recipe (my mother included she is a wicked ice cream fan) I thought I could do more to it. 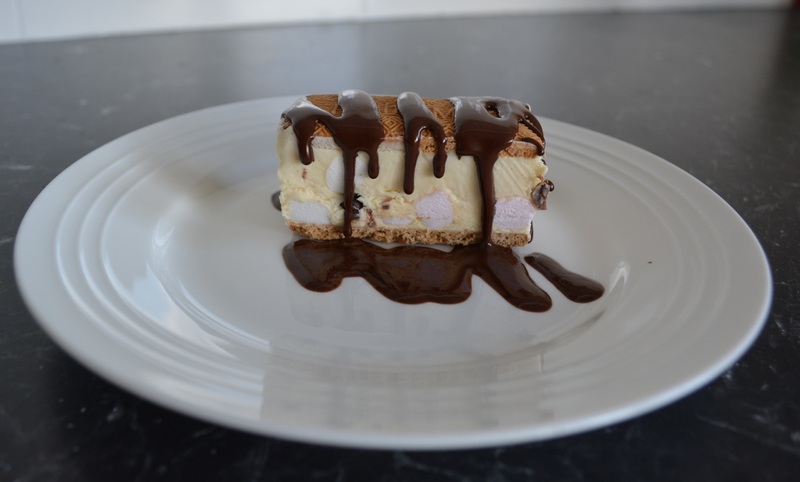 So I added marshmallows and chocolate chips and turned it into a rocky road ice cream slice. Now I am happy, I loved it. The rocky road version is even great without the chocolate sauce, so you can easily make this for parties. You could even add Ice Magic on it, sprinkle over some chopped nuts and refreeze until needed, and keep improving this recipe, that is what I will try tonight. Any chocolate bar can be added really, whatever you love, my kids don't like mint much so next time for myself I plan on making one with peppermint crisp, no sharing. As for my kids they want me to make their next one with mini M&M's instead of chocolate chips. You can use whatever you like really, it really is a simple recipe that is a base recipe that can be played with. Also regarding the biscuits, the malt biscuits give you nice slices, you can use round biscuits but when slicing you won't get a nice ice cream sandwich. This recipe I doubled for a party recently, but forgot to serve it as I had so many other desserts. Now after being in the freezer for 2 weeks, it is still absolutely perfect. So this is a great make ahead dessert that can easily be doubled. For perfect ice cream sandwiches make sure your tin has a straight/perpendicular edge from base to top. That way the biscuits align perfectly. The chocolate sauce, if any leftover keeps for 3-4 days in the refrigerator. Cost wise, this is far cheaper to make than buying store bought ice cream, and by doubling the recipe you get to serve a lot of people. Now go ahead and make this, your family and friends will love it. Line a 30cm x 20cm slice pan with 2 sheets of plastic wrap, make sure the plastic wrap over hangs on all sides. This will make it easy to pull out the slice once frozen. Place a layer of the biscuits face down on the base of your prepared tin. Place the cream and sweetened condensed milk in a bowl of an electric mixer. Beat for 4-5 minutes on high speed until the mixture thickens. Roughly crush the violet crumble bars, you want it crushed but still have chunks in it. Add the crushed violet crumble, marshmallows and choc chips to the cream mixture and gently fold it in. Now carefully pour over your biscuits, making sure you do not move the biscuits that have lined the base of your tin. Now place another layer of the malt biscuits on top in the same direction of your base biscuits, but face up this time. Cover with cling film, then a layer of aluminium foil, then freeze overnight. The longer the biscuits freeze, the softer they become. Chocolate Sauce: Place the cream and milk in a saucepan over medium heat, bring to just below boiling point. Place the chocolate and cocoa in a heatproof bowl, pour over the hot cream and stir until the chocolate is melted and the mixture is smooth. Set aside to cool. Slice the ice cream slice using the biscuits as a guide, then drizzle over your chocolate sauce and sprinkle over the chopped peanuts, if using, serve immediately. 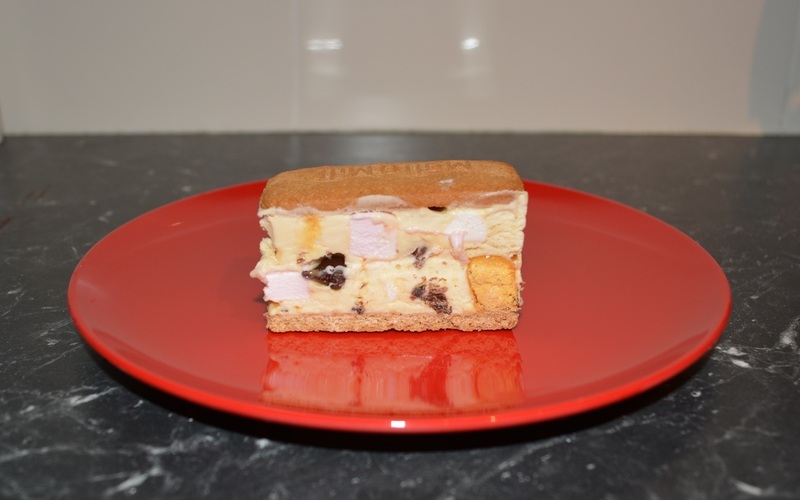 The Rocky Road Ice Cream Slice is great just as it is.